I wanted so badly to recommend Matt Shoemaker here, but there’s simply no way to get around Joey Lucchesi. He possesses a 2-1 record with a 4.40 ERA and a 1.33 WHIP through three starts. He also owns a 2.86 xFIP and 3.59 SIERA, suggesting he’ll see positive regression as he throws more innings. More importantly, Lucchesi boasts a 10.7 K/9, while not allowing any home runs through 14.1 innings. His swinging strikeout percentage also increased from 10.6% last season to 13.8% this season. Lucchesi gets an elite matchup against the Colorado Rockies, who have struggled offensively away from Coors this season. They lead the slate in strikeouts per at-bat, while ranking second last in team wOBA. Lucchesi is a -159 favorite in a game set at only 7 runs, giving Colorado an implied run total of only 3.1 runs tonight. He has flashed tremendous upside earlier in the season, and Lucchesi is one of the best pitching options on this slate. Jason’s Reaction: Luchhesi is easily the best pitcher option on the board tonight. Roster him in all leagues. Yu Darvish is wildly inconsistent, but he makes for a great option in tournaments tonight against the Miami Marlins. The Marlins strikeout 0.28 times per at-bat, which is the second highest of any team on the slate tonight behind the Colorado Rockies. Darvish is averaging 10.2 SO/9, and while his HR/9 is entirely too high, and his WHIP is sitting at 1.541, he still has quite a bit of upside. Over the last 15 days, he is averaging only 26% of his batted balls as fly balls, 50% of his batted balls as ground balls, and a moderate 33% of his batted balls as hard hits. That is a good indicator for his home run issue. Also, over the last 15 days, his average batted ball distance is down 16 feet from his 12-month average, as well as his average exit velocity, which is down 1 MPH from his 12-month average. Darvish is not trustworthy in cash games, but his lower price tag makes him difficult to avoid in tournaments. Justin’s Reaction: Darvish hasn’t looked the same since his injury, and I’ve consistently avoided him. It’s tough to avoid him in this matchup, though. He should strictly be used in tournaments, and I have no confidence in him. The metrics line up well, though. Paul Goldschmidt has struggled quite a bit early this season, as he’s hitting only .203 through 15 games. With that being said, he also owns seven extra-base hits (six home runs) and 10 RBIs in those games. He has also dominated the Milwaukee Brewers through four games this season, posting a .375 average with a 1.125 slugging percentage and a 1.569 OPS. Goldschmidt’s peripherals are significantly better than his numbers represent, as well, as he owns 50% hard hit and 53% fly ball rates with a 94 mph exit velocity over the last 15 days. He gets a matchup against Freddy Peralta, who is a wild pitcher that has thrown his fastball over 80% of the time this season. He knows three total pitches, and the lack of variety will be an issue against a hitter as good and experienced as Goldschmidt. The Cardinals first baseman enters this game with 0.013 wOBA and 0.029 ISO differentials against right-handed pitching, and he’s looking to be in line for quite a bit of power tonight. Jason’s Reaction: I never turn down a good Goldy recommendation. Yonder Alonso could have very well made it onto the home run prop bets article, as he possesses quite a bit of upside tonight for the Chicago White Sox, irrespective of his price tag. Heath Fillmyer will be the first to take the mound for the Kansas City Royals, and his terrible 6.4 K/9 and 46% hard hits allowed rate makes him an interesting pitcher to pick on tonight. This game is going to be cold, so beware of that, but Alonso is too cheap to pass on. He is hitting clean-up for the White Sox, so there should be RBI opportunities aplenty, and he is currently sporting 0.044 and 0.062 wOBA and ISO differentials against right-handed pitching. His average batted ball distance over the last 15 days is 229 feet, his hard hit rate is 46%, and his fly ball rate is 42%. These are all great potential home run indicators. Alonso is a top option at the first base position tonight in tournaments. Justin’s Reaction: He’s no Pete, but I’m good with this recommendation in tournaments tonight. I’m getting slightly tired of the easy value lock that is Brandon Nimmo. What does he have to do to see his price increase? Over his last 10 games, he’s hitting .286 with a .543 slugging percentage and a .918 OPS. He has scored fantasy points in nine of his last 10 games, while also averaging 12.5 fantasy points per game over his last six contests. As if that isn’t enough, Nimmo owns 44% hard hit and fly ball rates with a 93 mph exit velocity over the last 15 days. He gets a terrible matchup against Aaron Nola, but he’ll be playing in one of the more hitter-friendly stadiums in the MLB. Nimmo also enters this game with 0.059 wOBA and 0.096 ISO differentials against right-handed pitching. He’s leading off once again for the New York Mets, and there’s no reason to avoid him for this price tag. Jason’s Reaction: I feel you, Justin. Kole Calhoun is consistently in the same boat. Do I really even need to explain why Kole Calhoun is such a great option at the outfield position tonight? He has a 0.108 ISO differential against right-handed pitching, and Shelby Miller is taking the field for the Texas Rangers. Texas is a great place for high-upside batters, and Calhoun is averaging 0.041 HR/AB. Over the last 15 days, he possesses an average batted ball distance of 221 feet, an average exit velocity on those batted balls of 95 MPH, a 37% hard hit rate, and a 37% fly ball rate. His recent batted ball luck indicator suggests that he should only produce more fantasy points per game than he has already been producing. 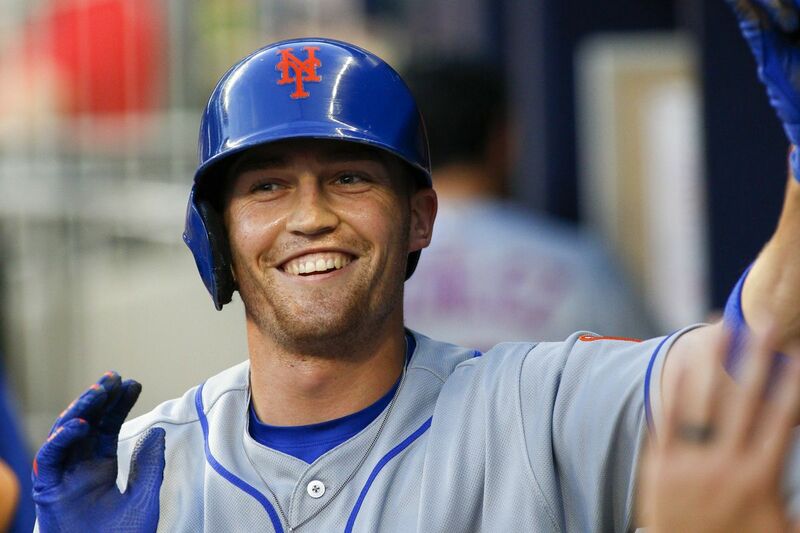 Oh, and he is hitting leadoff, much like Brandon Nimmo. Do not avoid Calhoun just because he should be high owned. Justin’s Reaction: I’d rather use Nimmo, but I have no problem rostering both of these players so I can spend up at pitcher. Be sure to follow Justin (@BalesSJustin) and Jason (@BalesTJason) on Twitter!